For the surname, see Boer (surname). Not to be confused with Boeroes, descendants of Dutch settlers in Suriname. Boer (/ˈboʊər, bɔːr, bʊər/; Afrikaans: [buːr]) is the Dutch and Afrikaans noun for "farmer". In South African contexts, "Boers" (Afrikaans: Boere) refers to the descendants of the then Dutch-speaking settlers of the eastern Cape frontier in Southern Africa during the 18th and much of the 19th century. From 1652 to 1795 the Dutch East India Company controlled this area, but the United Kingdom incorporated it into the British Empire in 1806. The term Afrikaner is generally used in modern-day South Africa for the Afrikaans-speaking white population of South Africa, the descendants of boer settlers and the bulk of White Africans. The Dutch East India Company had been formed in the Dutch Republic in 1602, and the Dutch had entered keenly into the competition for the colonial and imperial trade of commerce in Southeast Asia. The end of the Thirty Years' War in 1648 saw European soldiers and refugees widely dispersed across Europe. Immigrants from Germany, Scandinavia, and Switzerland journeyed to Holland in the hope of finding employment at the VOC (Dutch: Vereenigde Oostindische Compagnie). During the same year one of their ships was stranded in Table Bay, and the shipwrecked crew had to forage for themselves on shore for several months. They were so impressed with the natural resources of the country that on their return to the Republic, they represented to the directors of the company the great advantages to the Dutch Eastern trade to be had from a properly provided and fortified station of call at the Cape. The result was that in 1652, a Dutch expedition led by surgeon Jan van Riebeek constructed a fort and laid out vegetable gardens at Table Bay. Landing at Table Bay, Van Riebeek took control over Cape Town, and after ten years and one month of governing the settlement, in 1662, Jan van Riebieeck stepped down as Commander at the Cape. In 1671 the Dutch first purchased land from the native Khoikhoi beyond the limits of the fort built by Van Riebeek; this marked the development of the Colony proper. As the result of the investigations of a 1685 commissioner, the government worked to recruit a greater variety of immigrants to develop a stable community. They formed part of the class of "vrijlieden", also known as "vrijburgers" (free citizens), former Company employees who remained at the Cape after serving their contracts. A large number of vrijburgers became independent farmers and applied for grants of land, as well as loans of seed and tools, from the Company administration. During 1688–1689, the colony was greatly strengthened by the arrival of nearly two hundred French Huguenots. Political refugees from the religious wars in France, following the revocation of the Edict of Nantes, they were settled at Stellenbosch, Drakenstein, Franschhoek and Paarl. The influence of this small body of immigrants on the character of the Dutch settlers was marked. The Company in 1701 directed that only Dutch should be taught in the schools. This resulted in the Huguenots assimilating by the middle of the 18th century, with a loss to the community in the use and knowledge of French. The little settlement gradually spread eastwards, and in 1754 the country as far as Algoa Bay was included in the colony. At this time the European colonists numbered eight to ten thousand. They possessed numerous slaves, grew wheat in sufficient quantity to make it a commodity crop for export, and were famed for the good quality of their wines. But their chief wealth was in cattle. They enjoyed considerable prosperity. Through the latter half of the 17th and the whole of the 18th century, troubles arose between the colonists and the government. The administration of the Dutch East India Company was extremely despotic. Its policies were not directed at development of the colony, but to using it to profit the Company. The Company closed the colony against free immigration, kept the whole of the trade in its own hands, combined the administrative, legislative and judicial powers in one body, prescribed to the farmers the nature of the crops they were to grow, demanded a large part of their produce as a kind of tax, and made other exactions. From time to time, servants in the direct employment of the company were endowed with the right of "freeburghers"; but the company retained the power to compel them to return into its service whenever they deemed it necessary. This right to force into servitude those who might incur the displeasure of the governor or other high officers was not only exercised with reference to the individuals themselves who had received this conditional freedom; it was claimed by the government to be applicable likewise to the children of all such. The effect of this tyranny was inevitable: it drove men to desperation. They fled from oppression, and even before 1700 trekking began. In 1780, Joachim van Plettenberg, the governor, proclaimed the Sneeuberge to be the northern boundary of the colony, expressing "the anxious hope that no more extension should take place, and with heavy penalties forbidding the rambling peasants to wander beyond." In 1789, so strong had feeling amongst the burghers become that delegates were sent from the Cape to interview the authorities at Amsterdam. After this deputation, some nominal reforms were granted. It was largely to escape oppression that the farmers trekked farther and farther from the seat of government. The company, to control the emigrants, established a magistracy at Swellendam in 1745 and another at Graaff Reinet in 1786. The Gamtoos River had been declared, c. 1740, the eastern frontier of the colony; but it was soon passed. In 1780, however, the Dutch, to avoid collision with the warlike Bantu tribes advancing south and west from east central Africa, agreed with them to make the Great Fish River the common boundary. In 1795 the heavily taxed burghers of the frontier districts, who were afforded no protection against the Bantus, expelled the officials of the Dutch East India Company, and set up independent governments at Swellendam and Graaff Reinet. 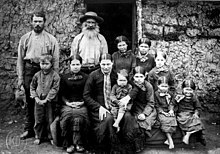 The Trek Boers of the 19th century were the lineal descendants of the Trek Boers of the 18th century. What they had learnt of government from the Dutch East India Company they carried into the wilderness with them. The end of the 19th century saw a revival of this same tyrannical monopolist policy in the Transvaal. If the formula, "In all things political, purely despotic; in all things commercial, purely monopolist," was true of the government of the Dutch East India Company in the 18th century, it was equally true of Kruger's government in the latter part of the 19th. The underlying fact which made the trek possible is that the Dutch-descended colonists in the eastern and northeastern parts of the colony were not cultivators of the soil, but of purely pastoral and nomadic habits, ever ready to seek new pastures for their flocks and herds, and possessing no special affection for any particular locality. These people, thinly scattered over a wide territory, had lived for so long with little restraint from law that when, in 1815, by the institution of "Commissions of Circuit", justice was brought nearer to their homes, various offences were brought to light, the remedying of which caused much resentment. The Invasion of the Cape Colony was a British military expedition launched in 1795 against the Dutch Cape Colony at the Cape of Good Hope. Holland having fallen under the revolutionary government of France, a British force under General Sir James Henry Craig was sent to Cape Town to secure the colony for the Prince of Orange, a refugee in England , from the French. The governor of Cape Town at first refused to obey the instructions from the prince; but, when the British proceeded to take forcible possession, he capitulated. His action was hastened by the fact that the Khoikhoi, deserting their former masters, flocked to the British standard. The burghers of Graaff Reinet did not surrender until a force had been sent against them; in 1799 and again in 1801 they rose in revolt. In February 1803, as a result of the peace of Amiens (February 1803), the colony was handed over to the Batavian Republic, which introduced many needed reforms, as had the British during their eight years' rule. One of the first acts of General Craig had been to abolish torture in the administration of justice. Still the country remained essentially Dutch, and few British settlers were attracted to it. Its cost to the British exchequer during this period was £16,000,000. The Batavian Republic entertained very liberal views as to the administration of the country, but they had little opportunity for giving them effect. When the War of the Third Coalition broke out in 1803, a British force was once more sent to the Cape. After an engagement (January 1806) on the shores of Table Bay, the Dutch garrison of Castle of Good Hope surrendered to the British under Sir David Baird, and in the 1814 Anglo-Dutch treaty the colony was ceded outright by Holland to the British crown. At that time the colony extended to the line of mountains guarding the vast central plateau, then called Bushmansland, and had an area of about 120,000 sq. m. and a population of some 60,000, of whom 27,000 were whites, 17,000 free Khoikhoi and the rest slaves, mostly imported blacks and Malays. Although the colony was fairly prosperous, many of the Dutch farmers were as dissatisfied with British rule as they had been with that of the Dutch East India Company, though their grounds for complaint were not the same. In 1792, Moravian missions had been established for the benefit of the Khoikhoi, and in 1799 the London Missionary Society began work among both Khoikhoi and Bantus. The missionaries' championing of Khoikhoi grievances caused much dissatisfaction among the majority of the colonists, whose views temporarily prevailed, for in 1812 an ordinance was issued which empowered magistrates to bind Khoikhoi children as apprentices under conditions differing little from that of slavery. Meantime, however, the movement for the abolition of slavery was gaining strength in England, and the missionaries appealed from the colonists to the mother country. An incident which occurred in 1815–1816 did much to make permanent the hostility of the frontiersmen to the British. A farmer named Frederick Bezuidenhout refused to obey a summons issued on the complaint of a Khoikhoi, and, firing on the party sent to arrest him, was himself killed by the return fire. This caused a small rebellion, known as Slachters Nek, in 1815, called “the most insane attempt ever made by a set of men to wage war against their sovereign” Henry Cloete. Upon its suppression, five ringleaders were publicly hanged at the spot where they had sworn to expel “the English tyrants.” The feeling caused by the hanging of these men was deepened by the circumstances of the execution , for the scaffold on which the rebels were simultaneously hanged broke down from their united weight and the men were afterwards hanged one by one. An ordinance was passed in 1827, abolishing the old Dutch courts of landdrost and heemraden (resident magistrates being substituted) and establishing that henceforth all legal proceedings should be conducted in English. The granting in 1828, as a result of the representations of the missionaries, of equal rights with whites to the Khoikhoi and other free coloured people, the imposition (1830) of heavy penalties for harsh treatment of slaves, and finally the emancipation of the slaves in 1834, were measures which combined to aggravate the farmers' dislike of government. Moreover, the inadequate compensation awarded to slave-owners, and the suspicions engendered by the method of payment, caused much resentment; and in 1835 the farmers again removed to unknown country to escape an unloved government. Emigration beyond the colonial border had in fact been continuous for 150 years, but it now took on larger proportions. 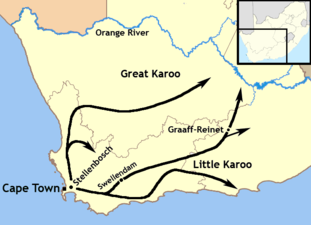 The migration of the trekboere from the Cape Colony into the Eastern Cape parts of South Africa gave rise to a series of conflicts between the Boers and the Xhosas. 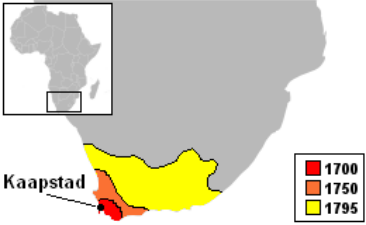 In 1775 The Cape government established a boundary between the trekboere and the Xhosas at the Bushmans and Upper Fish Rivers. The Boers and the Xhosas ignored the boundary and both groups established homes on either side of the frontier. Governor van Plettenberg attempted to persuade both groups to respect the boundary line without success. The Boers were constantly harassed by cattle thieves and in 1779 a series of skirmishes erupted along the border which initiated the 1st Frontier War. The frontier remained unstable, resulting in the outbreak of the 2nd Frontier War in 1789. Raids carried out by Boers and Xhosas on both sides of the boundary caused much friction in the area which resulted in several tribes being drawn into the conflict . In 1795, the British Invasion of the Cape Colony forced a change of government. After the government takeover the British began to draw up policies with regards to the frontier resulting in a Boer rebellion in Graaff-Reinet. The policies further caused the native Khoisan tribes joining the Xhosas in attacks against British forces during the 3rd Frontier War (1799 - 1803). 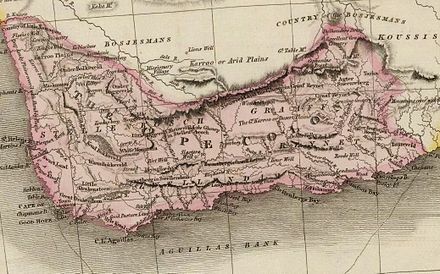 Peace were restored to the area when the British, under the Treaty of Amiens returned the Cape Colony to the Dutch Batavian Republic in 1803. In January 1806 during a second invasion, the British reoccupied the colony after the Battle of Blaauwberg. 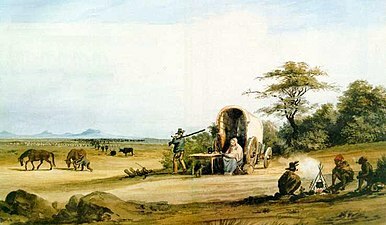 Tensions in the Zuurveld led the British administration and colonial forces to evict many of the Xhosa tribes from the area initiating the 4th Frontier War in 1811. Tribal Conflicts between the Xhosas on the frontier led to the beginning of the 5th Frontier War in 1819. The Xhosas were disgruntled by certain government policies of the time which resulted in large scale cattle thefts on the frontier. The Cape government responded with several military expeditions. In 1834 a large Xhosa force moved into the Cape territory which began the 6th Frontier War. Additional fortifications were built by the government and mounted patrols were not well received by the Xhosas who continued with raids on farms during the 7th Frontier War (1846 - 1847). The 8th Frontier War (1850 - 1853) and the 9th Frontier War (1877 - 1878) continued at the same pace as its predecessors. Eventually the Xhosas were defeated and the territories were brought under British control. The Great Trek occurred between 1835 and the early 1840s. During that period some 12,000 to 14,000 Boers (including women and children), impatient of British rule, emigrated from Cape Colony into the great plains beyond the Orange River, and across them again into Natal and the vastness of the Zoutspansberg, in the northern part of the Transvaal. Those Trekboere who occupied the eastern Cape were semi-nomadic. A significant number in the eastern Cape frontier later became Grensboere ("border farmers") who were the direct ancestors of the Voortrekkers. As the Voortrekkers progressed further inland, they continued to establish Boer settlements on the interior of South Africa. Though the Boers accepted British rule without resistance in 1877, they fought two Boer Wars in the late 19th century to defend their internationally recognised independent countries, the republics of the Transvaal (the Zuid-Afrikaansche Republiek, or ZAR) and the Orange Free State (OFS), against the threat of annexation by the British Crown. This led the key figure in organising the resistance, Paul Kruger, into conflict with the British. After the second Anglo-Boer War, a Boer diaspora occurred. Starting in 1903, the largest group emigrated to the Patagonia region of Argentina. Another group emigrated to British-ruled Kenya, from where most returned to South Africa during the 1930s, while a third group under the leadership of General Ben Viljoen emigrated to Mexico and to New Mexico and Texas in the southwestern United States. The Maritz Rebellion (also known as the Boer Revolt, the Five Shilling Rebellion or the Third Boer War) occurred in 1914 at the start of World War I, in which men who supported the re-creation of the old Boer republics rose up against the government of the Union of South Africa because they did not want to side with the British against Germany so soon after a long bloody war with the British. Many Boers had German ancestry and many members of the government were themselves former Boer military leaders who had fought with the Maritz rebels against the British in the Second Boer War. The rebellion was put down by Louis Botha and Jan Smuts, and the ringleaders received heavy fines and terms of imprisonment. One, Jopie Fourie, was convicted for treason when, as an officer in the Union Defence Force, he refused to take up arms with the British, and was executed in 1914. Afrikaans is a West Germanic language spoken in South Africa, Namibia and, to a lesser extent, Botswana and Zimbabwe. 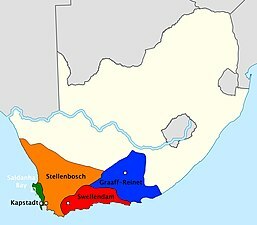 It evolved from the Dutch vernacular of South Holland (Hollandic dialect) spoken by the mainly Dutch settlers of what is now South Africa, where it gradually began to develop distinguishing characteristics in the course of the 18th century. Hence, it is a daughter language of Dutch, and was previously referred to as "Cape Dutch" (a term also used to refer collectively to the early Cape settlers) or "kitchen Dutch" (a derogatory term used to refer to Afrikaans in its earlier days). However, it is also variously described as a creole or as a partially creolised language. [n 1] The term is ultimately derived from Dutch Afrikaans-Hollands meaning "African Dutch". The desire to wander, known as trekgees, was a notable characteristic of the Boers. 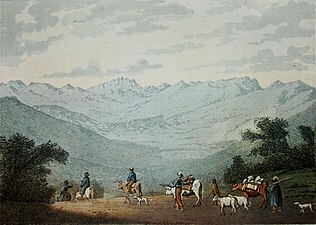 It figured prominently in the late 17th century when the Trekboere began to inhabit the northern and eastern Cape frontiers, again during the Great Trek when the Voortrekkers left the eastern Cape en masse, and after the major republics were established during the Thirstland (Dorsland) Trek. When one such trekker was asked why he has emigrated he explained, "a drifting spirit was in our hearts, and we ourselves could not understand it. We just sold our farms and set out northwestwards to find a new home." A rustic characteristic and tradition was developed quite early on as Boer society was born on the frontiers of white settlement and on the outskirts of civilisation. The Boer quest for independence manifested in a tradition of declaring republics, which predates the arrival of the British; when the British arrived, Boer republics had already been declared and were in rebellion from the VOC (Dutch East India Company). The Boers of the frontier were known for their independent spirit, resourcefulness, hardiness, and self-sufficiency, whose political notions verged on anarchy but had begun to be influenced by republicanism. Most of the men were also skilled with the use of guns as they would hunt and also were able to protect their families with them. The Boers had cut their ties to Europe as they emerged from the Trekboer group. The Boers possessed a distinct Calvinist culture and the majority of Boers and their descendants were members of a Reformed Church. The Nederduitsch Hervormde Kerk was the national Church of the South African Republic (1852–1902). The Orange Free State (1854–1902) was named after the Protestant House of Orange in the Netherlands. The Calvinist influence, in such fundamental Calvinist doctrines such as unconditional predestination and divine providence, remains present in much of Boer culture, who see their role in society as abiding by the national laws and accepting calamity and hardship as part of their Christian duty. A small number of Boers may also be members of Baptist, Pentecostal or Lutheran Churches. During recent times, mainly during the apartheid reform and post-1994 eras, some white Afrikaans-speaking people, mainly with "conservative" political views and of Trekboer and Voortrekker descent, have chosen to be called "Boere", rather than "Afrikaners," to distinguish their identity. They believe that many people of Voortrekker descent were not assimilated into what they see as the Cape-based Afrikaner identity. They suggest that this developed after the Second Anglo-Boer War and the subsequent establishment of the Union of South Africa in 1910. Certain Boer nationalists have asserted that they do not identify as a right-wing element of the political spectrum. 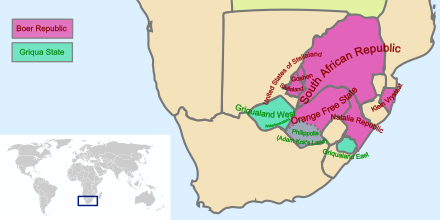 They contend that the Boers of the South African Republic (ZAR) and Orange Free State republics were recognised as a separate people or cultural group under international law by the Sand River Convention (which created the South African Republic in 1852), the Bloemfontein Convention (which created the Orange Free State Republic in 1854), the Pretoria Convention (which re-established the independence of the South African Republic 1881), the London Convention (which granted the full independence to the South African Republic in 1884), and the Vereeniging Peace Treaty, which formally ended the Second Anglo-Boer War on 31 May 1902. Others contend, however, that these treaties dealt only with agreements between governmental entities and do not imply the recognition of a Boer cultural identity per se. 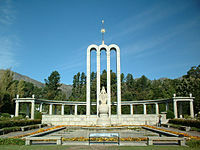 The supporters of these views feel that the Afrikaner designation (or label) was used from the 1930s onwards as a means of unifying (politically at least) the white Afrikaans speakers of the Western Cape with those of Trekboer and Voortrekker descent (whose ancestors began migrating eastward during the late 17th century and throughout the 18th century and later northward during the Great Trek of the 1830s) in the north of South Africa, where the Boer Republics were established. Since the Anglo-Boer war, the term "Boerevolk" was rarely used in the 20th century by the various regimes because of the effort to assimilate the Boerevolk with the Afrikaners. A portion of those who are the descendants of the Boerevolk have reasserted use of this designation. The supporters of the "Boer" designation view the term "Afrikaner" as an artificial political label which usurped their history and culture, turning "Boer" achievements into "Afrikaner" achievements. They feel that the Western-Cape based Afrikaners – whose ancestors did not trek eastwards or northwards – took advantage of the republican Boers' destitution following the Anglo-Boer War. At that time, the Afrikaners attempted to assimilate the Boers into a new politically based cultural label as "Afrikaners". The BCVO (Movement for Christian-National Education) is a federation of 47 Calvinist private schools, primarily in the Free State and the Transvaal, committed to educating Boer children from grade 0 through to 12. Some local Radio stations promote the ideals of those who identify with the Boer people, like Radio Rosestad (in Bloemfontein), Overvaal Stereo and Radio Pretoria. An internet-based radio station, Boerevolk Radio, serves as a mouthpiece for Boer separatists. Territorial areas in the form of a Boerestaat(Farmer's State) are being developed as settlements exclusively for Boer/Afrikaners, notably Orania in the Northern Cape and Kleinfontein near Pretoria. Koos de la Rey, general and regarded as being one of the great military leaders of the Second Anglo-Boer War. Fritz Joubert Duquesne, Boer captain known as the Black Panther, served in the Second Boer War. Captured in Mozambique, he escaped prison in Portugal and returned to South Africa as a British officer. In 1901, he was caught planning to sabotage strategic British installations in Cape Town and sentenced to life in prison; however, he escaped and was re-captured several times again throughout his life. In World War I, Duquesne spied for Germany, earning the Iron Cross for allegedly sinking HMS Hampshire thereby killing Lord Kitchener in 1916. He also served as a Nazi spy in the United States and, in 1941, he was caught by the Federal Bureau of Investigation (FBI) in the largest espionage case in US history: The Duquesne Spy Ring. ^ Stürmann, Jan (2005). New Coffins, Old Flags, Microorganisms and the Future of the Boer. Retrieved 2 December 2011. ^ Jones, Daniel; Gimson, Alfred C. (1977) . Everyman's English Pronunciation Dictionary. Everyman's Reference Library (14 ed.). London: J. M. Dent & Sons. ISBN 0-460-03029-9. ^ Bosman, D. B.; Van der Merwe, I. W.; Hiemstra, L. W. (1984). Tweetalige Woordeboek Afrikaans-Engels. Tafelberg-uitgewers. ISBN 0-624-00533-X. ^ a b Du Toit, Brian M. (1998). The Boers in East Africa: Ethnicity and Identity. p. 1. Retrieved 2 December 2011. ^ a b Trewhella Cameron; S. B. Spies (October 1991). A new illustrated history of South Africa. Southern Book Publishers. ^ Compare: Walker, Eric Anderson (1936). "14: The Formation of new states, 1835-1854". In Walker, Eric Anderson (ed.). The Cambridge History of the British Empire. 8: South Africa, Rhodesia and the protectorates. Cambridge: Cambridge University Press. p. 320-321. Retrieved 15 September 2018. In the latter part of 1834, the frontier districts were full of talk of a mass trek. Exploring parties rode out to South-West Africa, to the north-eastern Transvaal, and along the coast belt to Natal. [...] These preparations are conclusive evidence against the traditional idea that the two primary causes of the Great Trek were the inadequate compensation paid for emancipated slaves and the upsetting of D'Urban's settlement of the eastern frontier after the Kaffir War of 1834-5 by the combined forces of Downing Street and Exeter Hall. It is true that many Trekkers, and those the most vocal, came from the eastern frontier lands, but others came from the northern districts where there was no Kaffir menace. The overthrow of the settlement was only a subsidiary cause though a powerful one. ^ a b Hunt, John (2005). Campbell, Heather-Ann (ed.). Dutch South Africa: Early Settlers at the Cape, 1652–1708. Philadelphia: University of Pennsylvania Press. pp. 13–35. ISBN 978-1904744955. ^ History of the Emigrant Boers in South Africa, 2nd ed, G.M. Theal, London 1888. ^ Meredith, Martin (2007). Diamonds, Gold, and War: The British, the Boers, and the Making of South Africa. Public Affairs. p. 74. ISBN 978-1-58648-473-6. ^ a b Ransford, Oliver (1973). "13: Epilogue". The Great Trek. Retrieved 2 December 2011. ^ a b Mills, Wallace G. "White Settlers in South Africa to 1870". Archived from the original on 26 September 2007. Retrieved 2 December 2011. ^ Ransford, Oliver (1973). "1: Trekboers". The Great Trek. Retrieved 2 December 2011. ^ a b c Yolandi Groenewald. "Bang bang – you’re dead", Mail & Guardian Online. ^ Sandra Swart. Journal of Southern African Studies. 30.4, Dec 2004 Archived 8 March 2010 at the Wayback Machine. ^ Adriana Stuijt (former South African journalist). "Boer, Afrikaner Or White – Which Are You?" 2004. ^ Christopher, Riches; Palmowski, Jan (1965). A dictionary of contemporary world history : over 2800 entries. ISBN 9780191802997. OCLC 965506087. ^ "Beweging vir Christelik Volkseie Onderwys". Retrieved 1 December 2011. "South Africa § III. History" . Encyclopædia Britannica. 25 (11th ed.). 1911. pp. 469–81. "Boer" . New International Encyclopedia. 1905.